Purpose iST Kits offer all-in-one and simple-to-use solutions for reproducible preparation from any starting material to clean peptide mixtures in just 1 hour for LC-MS measurements. Components The kit contains all you need to perform a complete sample preparation. It includes all chemicals to denature, reduce and alkylate proteins as well as the enzymes to perform a tryptic digest and a final clean up. 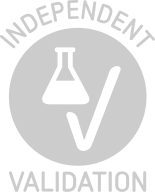 Material not included Common lab equipment is required for the sample preparation. 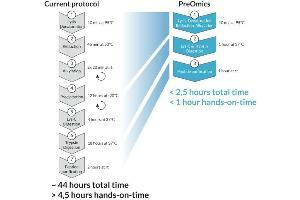 Sample preparation is one of the essential steps of bottom-up proteomics. The sample preparation kit is designed to assist you achieving best results with few sample preparation steps and little hands-on time. Product cited in: Doll, Kriegmair, Santos, Wierer, Coscia, Neil, Porubsky, Geyer, Mund, Nuhn, Mann: "Rapid proteomic analysis for solid tumors reveals LSD1 as a drug target in an end-stage cancer patient." in: Molecular oncology, 2018 (PubMed). Karg, Smets, Ryan, Forné, Qin, Mulholland, Kalideris, Imhof, Bultmann, Leonhardt: "Ubiquitome Analysis Reveals PCNA-Associated Factor 15 (PAF15) as a Specific Ubiquitination Target of UHRF1 in Embryonic Stem Cells." in: Journal of molecular biology, 2017 (PubMed).